During May, my boyfriend and I took our mothers to Paris for a long weekend away. It was a great chance for them to get to know each other a little better and it was also a trip we had been wanting to make for a while. 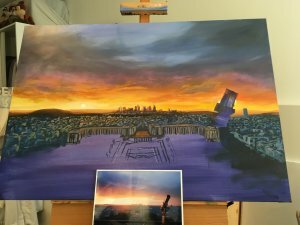 Paris is a beautiful city and i couldn’t wait to capture some new material for my paintings. I took over 1400 photos over the course of the weekend, but a few I’ve put aside for some new works. Our first evening in Paris we finished with a trip to the Eifel Tower. I had just been raining and we were hoping to get a good view despite the clouds. Luckily for us they began to part as we rose in the lift and a piercing pink and orange sunset greeted us at the top. The view was absolutely breath taking, i’ve never seen colours like those in real life before, purples, deep blues, oranges, pinks, reds and golds. Truly stunning. 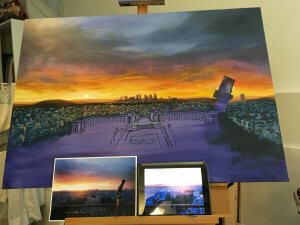 I began this painting with a large canvas, 100cm x 70cm, and started by drawing a grid to more easily plot out the painting. 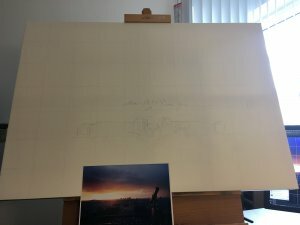 It’s a useful technique to ensure the proportions are correct when transferring drawings to a larger medium. 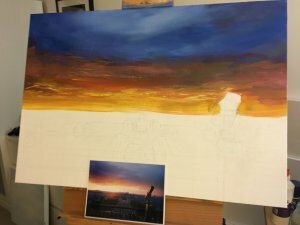 Once I was happy with the drawing, it was time to start painting, starting with the sky. The first run was mostly to set the tone, the colours are a bit garish at this stage but it’s important to get rid of the white canvas beneath to start building the layers. 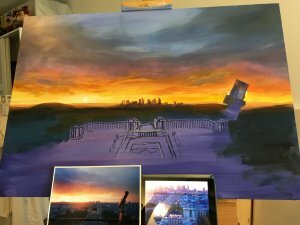 Next step was to refine the sky and paint in a tonal ground for the bottom half of the painting. I put the painting onto some spare cardboard to avoid drips and to allow the paint to dry evenly. 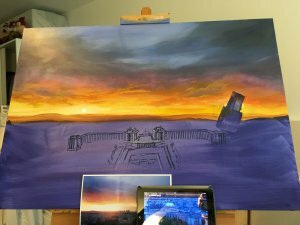 I think the colours and style are starting to come together at this stage, the sky looks great and its time to get stuck into details. You can still just make out the pencil lines beneath the purple wash and with some paint markers i begin to redraw the outlines in. 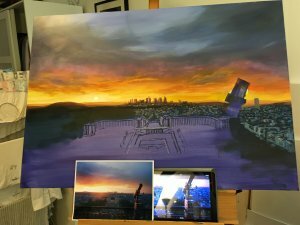 Once i’d finished with the markers I began to paint the horizon and the distant buildings. I wanted them to appear almost ethereal so I kept them fairly close in colour to the horizon and the sky. I also used this to begin building up the lay of the land. The next phases was to fill in the city, I was keen to keep it fairly minimal on the detail and used a lot of short quick marks to give the impression of buildings from a distance. Despite keeping to quick marks this section still took a long time. 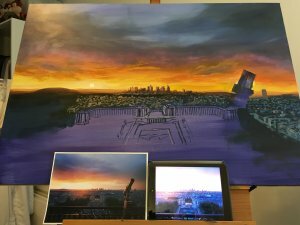 After completing the city I moved on to the buildings and areas i wanted to how off in more detail and began painting in the other land marks. And finally i started blocking in the foliage. I used a lot of paint and quite thickly applied to give as much texture as possible. 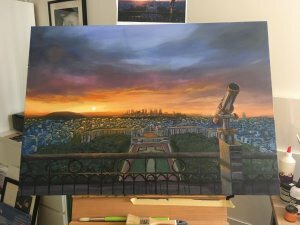 It took a lot of work but I was finally ready to start work on the foreground, i started by using masking tape to paint in the railing. 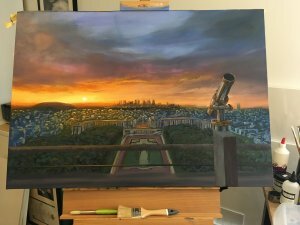 Once i was happy with the positioning i moved on to the telescope, first i redrew it with a chalk pencil and then began to fill it in. 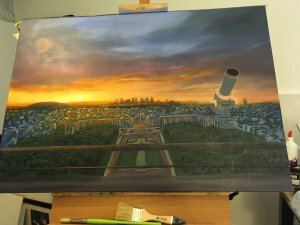 The telescope was pretty fun to paint, i’ve never painted anything metallic before so it was interesting to play with reflections and lighting on it. 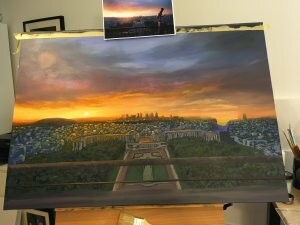 And finally the last step was to add the details to the railings and any etc highlights to the rest of the painting. I addd a lot of water droplets to the foreground to capture how it sparkled in the light. That’s all folks, hope you enjoyed reading and seeing the stages in one of my paintings. Come back again soon to see my next piece. Over the bank holiday weekend i had a few experiments with some views of Lincoln, mostly the castle with varying success. in the end I scrapped the painting I was working on and had a quick go at a speed painting to reset myself. It came out quite well, very dramatic lighting and I may decide to put this into the grainthorpe exhibition in august. As for the other painting i may take another stab at it or reuse the canvas for something else. This is my latest painting. It’s based on a picture i took while walking around Dovestone Resevoir. It was a gorgeous sunny day and it was mostly quiet save a few other walkers. For the most part I’m not entirely happy with this picture, overall I feel its lacking life and drama, maybe it was the time of day, sunshine doesn’t always lend itself to dramatic scenes. It was a good experiment to try some more conventional colours but I think for my next piece I’ll look to do something more exciting. 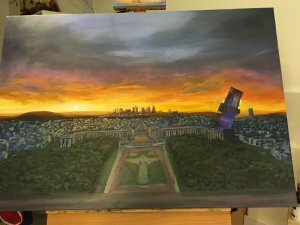 So after watching the final of the Big Painting Challenge, I was inspired to have a go at something but under a time limit. Technically I’d already pre prepped a canvas a few days before with a warm grey, but other than that I did this in under an hour. 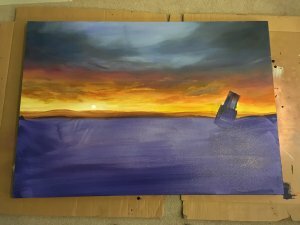 I wanted to experiment with some more realistic colours and to use some acrylic gloss medium to see if I could achieve the effect of oils, which I think was largely successful. The painting itself is 30cm x 30cm acrylic on canvas. It was a fun little experiment and I think it came out well.